I have recently revised my discussion of Criminal Penalties in Chapter 8 of the Federal Tax Procedure Book. 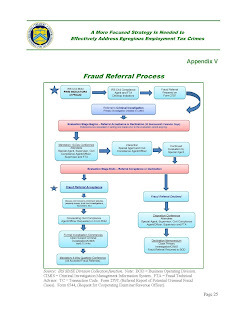 In the revised discussion, I cover the IRS's civil division fraud referral program under which civil revenue agents and collection officers identify "firm indications of fraud" and refer cases to IRS's Criminal Investigation ("CI"). 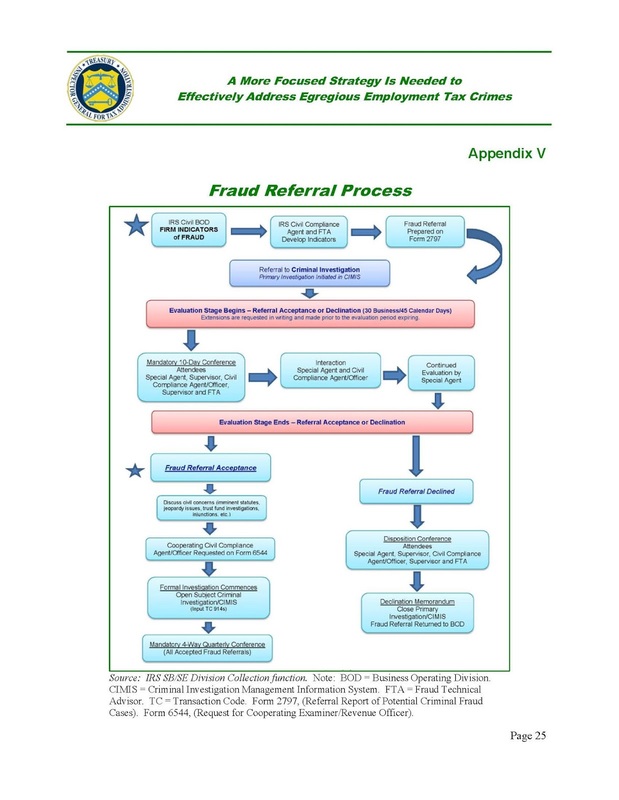 In a recent TIGTA report, A More Focused Strategy Is Needed to Effectively Address Egregious Employment Tax Crimes (Ref # 2017-IE-R004 3/21/17), here, TIGTA included a graphic (Appendix V) that shows how that program works. I include that graphic below (click on it to enlarge it for easier readability) and will link to this graphic in the revised version of the book, currently scheduled to be published in pdf format in August 2017.